Born in 1967, I studied electrical engineering at the munich technical university and graduated with a "Diplom Ingenieur" degree. 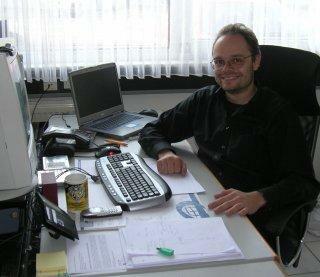 My professional career started in a small milling company in Salzburg/Austria, where I successfully computerized many processes. Shortly after that, I joined a well known austrian die bonder manufacturer and rose from software developer to head of a 20 person department. While being there I met my partner, Thomas Reith and in the year 2000, we decided to found our own company for industrial automation. Currently I am one of the directors of AMADYNE, responsible for soft- and hardware design and implementation, prototype assembly and IT services. Ever since I have proceeded from employee to employer, my point of view has shifted a bit. What you see always depends on where you stand. And yet I still want to obey my principles. The enterprise knows neither accolade nor gratitude (I have made this experience personally hard enough), but the people forming the enterprise do. This is why it is very important for me to face my colleagues in the most equitable and decent way and offer them (if not enormous amounts of money, at least) a place where they feel well and can recognize the sense in what they are doing. And - part from that - I am always suspicious of companies, the employees don't sometimes laugh and mock about. As a passionate technician, I enjoy the luxury to treat my colleagues (as well as customers and suppliers) as mature human beings and simply tell them the unmasked thruth (well, unless an NDA or something like that keeps me from doing so). If we don't have the know how, if our products do not match the customers requirements, if we're still searching for a fix on a known problem and don't have a clue yet - In none of these cases has an honest information turned out bad for me.